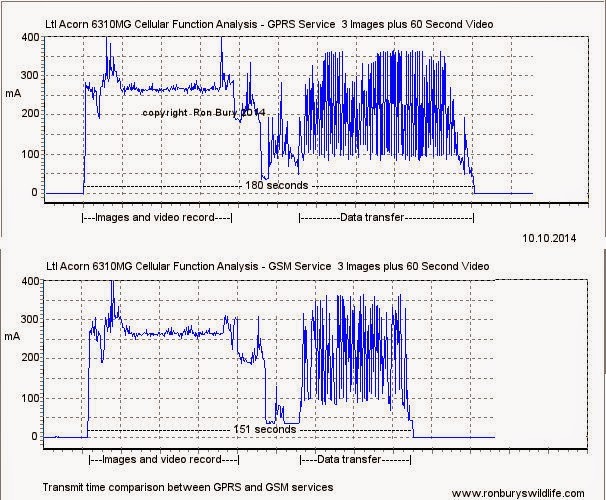 This post is an explanation of how the interval time setting in the cameras menu affects the transmission of image data over a 2G cellular network. This does not apply to the 6310 cameras with 3G modems when working over a 3G network, which were introduced at the end of 2016. 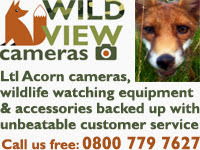 Acorn cellular cameras use the SIM900 GPRS 2G modem which can connect with either the GSM or the GPRS service. It is a class B device which means it can only use one or the other at a given time. During GSM service ( voice call, SMS and MMS ) the GPRS service is suspended, and then resumed automatically after the GSM service has concluded. Acorn cellular cameras utilise the SIM900 wireless modem to provide GSM ( SMS and MMS ) and GPRS ( internet access for sending an image in an email using SMTP ) functionality. input occurring during the transmission of an image using SMTP, regardless of the SMS remote control function's on/off state. Trigger to end of transmission with good data transfer. Trigger to end of transmission with slow data transfer. For the proper operation of cameras using the GPRS service to send images via email ( SMTP ) it is essential that the interval time ( during which the camera will not trigger ) is set to a long enough period to cover the time the camera takes to shoot the images and video, plus the time required for the transmission of the compressed image from the MMS folder. If the transmission of an image is interrupted by the camera being triggered, the SIM900 appears to switch from the GPRS service to the GSM service to enable it to receive SMS. Connection to the GSM service is typified in a current trace by a steady 35mA draw and characterised by its connect and disconnect signatures as shown in figure 3. 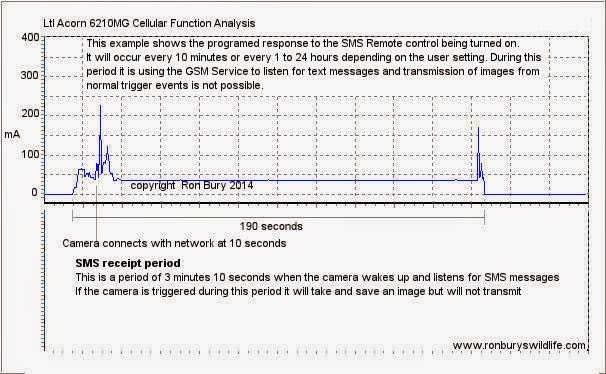 Figure 3 shows the programed response to the SMS Remote control being turned on. It will occur every 10 minutes or every 1 to 24 hours depending on the user setting. 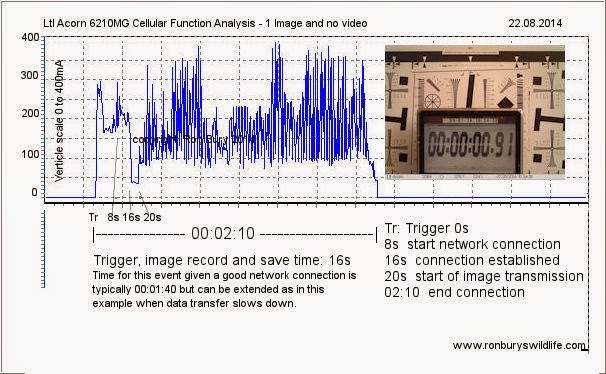 During this period it is using the GSM Service to listen for text messages and transmission of images from normal trigger events is not possible for a period of 3 minutes 10 seconds. This also conflicts with the use of the time lapse function if set to ON and if the SMS Remote Control Function is used I would recommend the SMS Receipt time be set to 24 hours to minimise this. I will cover this in more detail in my next post. This is why users believe that their camera is not connecting to the network when they don't receive images that have been saved to the SD card. 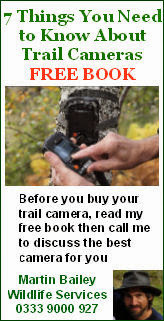 The camera is connected to the network but can't transmit because it is temporarily connected to the GSM service. Figures 4a shows what happens when the interval is set too short and the transmission of the image data overruns due to network congestion and the resulting slow data transfer. Fig 4a: In this example the transfer of the image data is very slow and overruns the interval time due to network congestion. The camera's interval time was set to 2 minutes. 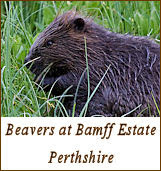 Left click the image to view full screen. Figure 4b show the results from a 6210MG set to take 1 image per trigger event with a 0 second interval and then subjected to continuous triggering. 37 images are saved to card and only 1 image has been successfully transmitted. A 0 second interval is not a practical setting but is used in this instance to illustrate its affect on data transmission. Fig 4b: 1 Image and no video. Continuous triggering with a 0 second interval setting. Left click the image to view full screen. unsuccessful attempts to transmit more images when there is a pause in the triggering. Ultimately, as in this example, the modem will give up trying, shut down and not function again until the camera is reset. 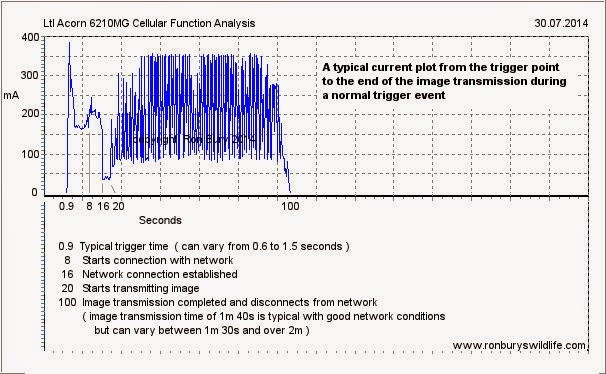 If the interval setting is too short and a trigger event occurs while the camera is still transmitting ( figure 4a ) then the modem will switch to the GSM service for between 3 to 9 minutes during which time it will not transmit. It will however still take and store images ( subject to the interval time setting ) to the SD card. Before the first quarter of 2014 the interval time selection in the menus of all models gave the result you would expect where if you set the interval to say 30 seconds, 1, 2, 3 minutes et.c then you would see an interval between trigger events which roughly corresponded to the time you entered in the menu. Currently all the 5000 series cellular cameras deliver the interval time set in the menu. Earlier this year ( I can't be certain exactly when ) I became aware that Acorn had changed the base programming for the menu in the 6210MG model so that now the 1 minute interval setting is actually about 2 minutes 10 seconds. Any menu setting below the 1 minute default ( 2 minutes 10 seconds actual ) is unworkable because of the time required to transmit the image data. The reason for the change is to attempt to mitigate the effects outlined above whilst the interval setting is left at the menu default of 1 minute, thus simplifying the menu setup. I am currently testing all the 6000 series cellular camera models to verify the interval timing. It is important to remember that when shooting image/s plus video, the camera takes and saves the video immediately after the image/s and before the image data is transmitted. Bearing in mind that the average time taken to shoot, save and send a single image, with a good data transfer speed using the GPRS service is about 1 minute 40 seconds ( see figures 2a and 2b ), then extra images ( 2 or 3 ) and a given length of video must be added to the overall time ( see figures 5a and 5b below ). 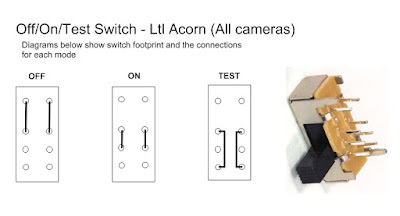 Because of this the Acorn 6000 series cellular cameras are programmed so that when using the menu's 1 minute default interval setting an extra time period is added to accommodate the video length selected. This is not the case with the 5000 series cameras where the interval time needs to be set to 2, 3 or 4 minutes depending on the camera's mode setting, length of video and network performance. When sending an MMS image via the GSM service the time taken to transmit the image data will on average be about 20 seconds faster than when sending the same via SMTP using the GPRS service. I've included this note here because many users who experience the issues dealt with in this post feel that they are having problems because of a low signal. This is a bit like folk law as many believe that their camera will not connect to the network when the received signal indication is below three bars. While it is true that any mobile device on the move which is receiving a weak signal from the tower is sometimes going to drop out in marginal reception areas, I would say that because these cameras are static this is less likely than with a cellphone. All my testing is done in a marginal area on a two bar ( sometimes 3 bars ) signal and rarely does the signal disappear or is low enough to stop the camera sending. Signals at 900 and 1800MHz are essentially line of sight but in my location the cell tower is behind a hill at a distance of 8.5 kilometres ( 5 miles ) and a steady workshop connection is achieved by using an 11dB gain Yagi antenna. Even in this location a camera placed outside with a 2dB gain whip antenna will work reliably most of the time. There are some atmospheric conditions such as layering which will affect the perceived signal strength particularly at dawn and dusk which is known as an atmospheric duct and will have the affect of increasing the range of the signal. What most often causes a sending problem is network congestion where although the camera is connected to the network it is temporarily denied access to send data. This will extend the time taken to send the image data which will then overrun the interval time and cause the problems described earlier. My next post will confirm and summarise the interval timing for all the Acorn cellular camera models, followed by an analysis of the SMS Remote Control's interaction with these settings.